Description This Marietta, Georgia hotel has an outdoor pool, free internet access and non-smoking guest rooms. Convenient to downtown and Six Flags White Water and offering free internet access and breakfast the Wyndham Garden Marietta Atlanta North strikes just the right chord with our guests. This four-floor hotel offers free high-speed internet access in all 139 rooms along with premium cable TV a work desk and very comfortable beds. The hotel prepares a free deluxe breakfast buffet for guests with plenty of hot and cold items to power you through the morning. The hotel's business center will help you take care of your needs on the road and after a day spent touring the area or working the on-site fitness center and outdoor pool are at your service. There's even a children's pool for the little ones. Parking is free at this hotel. 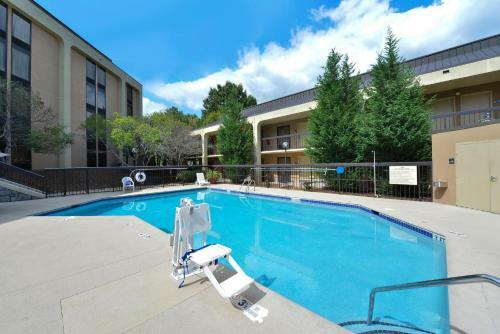 This Wyndham Garden is less than three miles from Six Flags White Water theme park and the hotel is surrounded by popular restaurants and shopping centers. The nightlife of Underground Atlanta is only 25 minutes away. Hartsfield-Jackson Atlanta International Airport is 26 miles from the hotel. Add Wyndham Garden Marietta Atlanta North to your free online travel itinerary.